I have to model a DC motor in MapleSim. Reading the help of the component EMF I can't undestand if it takes into account also the Back EMF or if I have to use a voltage generator and a rotational speed feedback loop. I have to build a simple model in MapleSim that allows to simulate a mass that goes down along an inclined plane with a certain friction. Is there a component that simulates the inclined plane? I tried to use a prismatic joint but it has some predifined translational directions so I can't impose the movement along the plane. I use MapleSim to model the dynamics of motorcycles. I have been at MapleSim2018 for a few months and I have a problem of simplifying the equations generated by MapleSim from my model. It is very strange that a new version of MapleSim generates a slower code than the old version. it may be due to the limitation of DSN / ix1lite in MapleSim2018 ... while MapleSim2016 does not have this limitation (with more equations to simplify!). 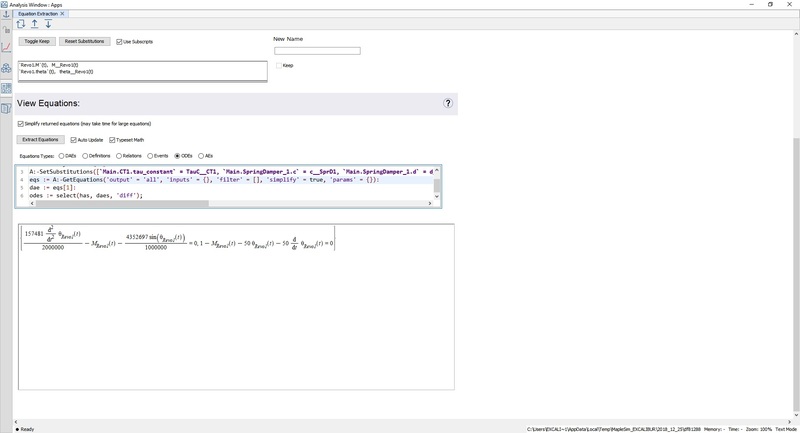 I need help, if it is possible to activate the complete simplification in DSN / ix1lite? it is a big problem for me, the use of MapleSim2018 is not possible because of that. My model does not pass in real time. 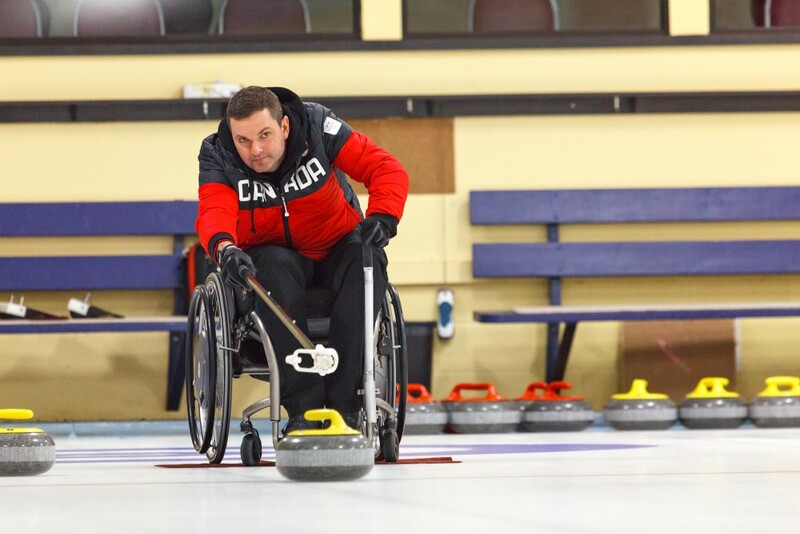 Recently, my research team at the University of Waterloo was approached by Mark Ideson, the skip for the Canadian Paralympic men’s curling team, about developing a curling end-effector, a device to give wheelchair curlers greater control over their shots. A gold medalist and multi-medal winner at the Paralympics, Mark has a passion to see wheelchair curling performance improve and entrusted us to assist him in this objective. We previously worked with Mark and his team on a research project to model the wheelchair curling shot and help optimize their performance on the ice. The end-effector project was the next step in our partnership. The use of technology in the sports world is increasing rapidly, allowing us to better understand athletic performance. We are able to gather new types of data that, when coupled with advanced engineering tools, allow us to perform more in-depth analysis of the human body as it pertains to specific movements and tasks. As a result, we can refine motions and improve equipment to help athletes maximize their abilities and performance. As a professor of Systems Design Engineering at the University of Waterloo, I have overseen several studies on the motor function of Paralympic athletes. My team focuses on modelling the interactions between athletes and their equipment to maximize athletic performance, and we rely heavily on Maple and MapleSim in our research and project development. The end-effector project was led by my UW students Borna Ghannadi and Conor Jansen. The objective was to design a device that attaches to the end of the curler’s stick and provides greater command over the stone by pulling it back prior to release. Our team modeled the end effector in Maple and built an initial prototype, which has undergone several trials and adjustments since then. The device is now on its 7th iteration, which we felt appropriate to name the Mark 7, in recognition of Mark’s inspiration for the project. The device has been a challenge, but we have steadily made improvements with Mark’s input and it is close to being a finished product. Currently, wheelchair curlers use a device that keeps the stone static before it’s thrown. Having the ability to pull back on the stone and break the friction prior to release will provide great benefit to the curlers. As a curler, if you can only push forward and the ice conditions aren’t perfect, you’re throwing at a different speed every time. If you can pull the stone back and then go forward, you’ve broken that friction and your shot is far more repeatable. This should make the game much more interesting. For our team, the objective was to design a mechanism that not only allowed curlers to pull back on the stone, but also had a release option with no triggers on the curler’s hand. The device we developed screws on to the end of the curler’s stick, and is designed to rest firmly on the curling handle. 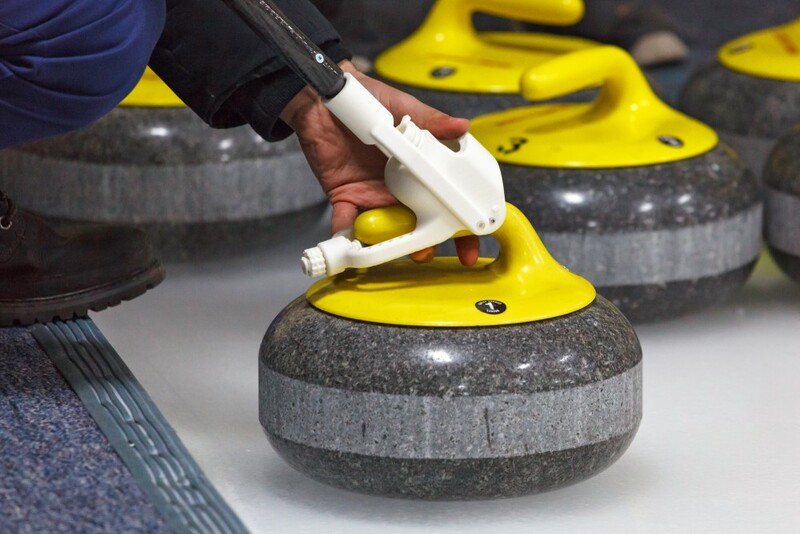 Once the curler selects their shot, they can position the stone accordingly, slide the stone backward and then forward, and watch the device gently separate from the stone. For our research, the increased speed and accuracy of MapleSim’s multibody dynamic simulations, made possible by the underlying symbolic modelling engine, Maple, allowed us to spend more time on system design and optimization. MapleSim combines principles of mechanics with linear graph theory to produce unified representations of the system topology and modelling coordinates. The system equations are automatically generated symbolically, which enables us to view and share the equations prior to a numerical solution of the highly-optimized simulation code. The Mark 7 is an invention that could have significant ramifications in the curling world. Shooting accuracy across wheelchair curling is currently around 60-62%, and if new technology like the Mark 7 is adopted, that number could grow to 70 or 75%. Improved accuracy will make the game more enjoyable and competitive. Having the ability to pull back on the stone prior to release will eliminate some instability for the curlers, which can help level the playing field for everyone involved. Given the work we have been doing with Mark’s team on performance improvements, it was extremely satisfying for us to see them win the bronze medal in South Korea. We hope that our research and partnership with the team can produce gold medals in the years to come. I did the model of the ABB IRB 120 in MapleSim, but I would like to lock several links but I do not know how to do it. Also I need the differential equations of the robot, which must be six differential equations but in MapleSim equation extraction page there are lots of equations. I am trying to (again) extract the equations of the systems which have been done by me, but the equation extraction gave me wrong results. The DC motor and the inverted pendulum equation must be 3. 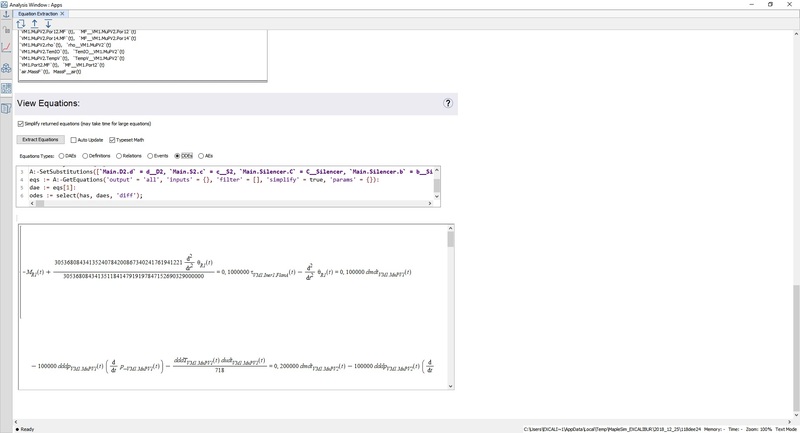 (third) order and only a differential equation. The pneumatic motor and the inverted pendulum must be a differential equation (any order). Also the hydraulic motor and the inverted pendulum must be a differential equation (any order). I tried to use "isolate" command but it did not work for me in this case. How can I get the differential equations of the systems ? I have added the MapleSim simulations and the differential equations that I had. Please help me for this problem chain. Error when running 'm_model.m' to generate simulink function block when using 'Group all parameters into nested structure'. 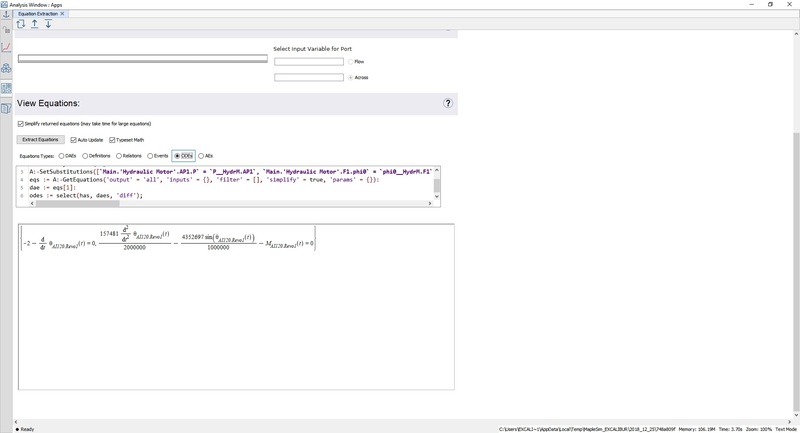 No errors when using 'Do not group parameters'. Invalid setting in 'MapleSim_fullSwing/MapleSim_fullSwing/MapleSimParameters' for parameter 'Value'. parameter 'Value' in 'MapleSim_fullSwing/MapleSim_fullSwing/MapleSimParameters' cannot be evaluated. I did the base part of a robot in the MapleSim. I am trying to get the differential equation of the system, but the MapleSim gave me 2 different differential equations. When I use these differential equations, I could not reach to my goal. I think I need only one differential equation whose degree must be 2. The system works well, but the problem is a differential equation of the system. How can I get the correct differential equation? And also, why are there 2 different equations? Which one represents what? Thanks for answering. We have just released updates to Maple and MapleSim, which provide corrections and improvements to product functionality. As usual, the Maple update is available through Tools>Check for Updates in Maple, and is also available from our website on the Maple 2018.2.1 download page, where you can also find more details. For MapleSim users, use Help>Check for Updates or visit the MapleSim 2018.2.1 download page. How could this be set up in Maplesim? A vibration signal is imparted on the box and we want to observe the behavior of the sprung object inside the box. We have just released an update to Maple, Maple 2018.2. This release includes improvements in a variety of areas, including code edit regions, Workbooks, and Physics, as well as support for macOS 10.14. This update is available through Tools>Check for Updates in Maple, and is also available from our website on the Maple 2018.2 download page, where you can also find more details. For MapleSim users, the update includes optimizations for handling large models, improvements to model import and export, updates to the hydraulics and pneumatics libraries, and more. For more details and download instructions, visit the MapleSim 2018.2 download page.